YOKOFAKUN: What is in a list of snp ? Here is a common question: "Here is a list of snp genotyped with a high p-value. Is there anything interesting in this snp list ? is there a common link between those snp ?" . Today, to answer this question, I've played with NCBI ELink. ELink checks for the existence of an external or Related Articles link from a list of one or more primary IDs; retrieves IDs and relevancy scores for links to Entrez databases or Related Articles; creates a hyperlink to the primary LinkOut provider for a specific ID and database, or lists LinkOut URLs and attributes for multiple IDs. . The java tool I created, AboutRsList, takes as input a list of rs. For each rs it calls ELink and get the links of this snp to pubmed, omim, ncbi-gene.... The information (title...) about each snp is then retrieved using ncbi/EFetch. Then the program creates a set of clusters of snps where each cluster has no link with another one. 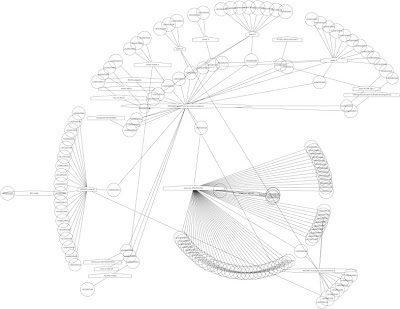 Each cluster is then saved as a SVG figure using graphviz dot. And an executable jar is available here: http://code.google.com/p/lindenb/downloads/list.